Babylonian amora of the third generation; colleague of R. Naḥman bar Jacob, with whom he had frequent arguments concerning questions of religious law. His teacher's name is not definitely known; but Sheshet was an auditor at Huna's lectures (Yeb. 64b; Ket. 69a). It is certain that he was not a pupil of Rab, since sayings of Abba Arika which did not please him were criticized by him with a disrespect which he would not have shown. toward his own teacher. Concerning many of Rab's sayings, Sheshet asserted that "he must have spoken thus when he was asleep" (Yeb. 24b and parallels; comp. also Niddah 69a). Sheshet lived first at Nehardea, where he used to study in the synagogue Shaf we-Yatib (Meg. 29a), going thence to Maḥuza (Ned. 78a, b; B. B. 121a), and later to Shilhe, where he founded an academy (Letter of Sherira Gaon, in Neubauer, "M. J. C." i. 29). He was feeble in body (Pes. 108a), but had, nevertheless, an iron will and great energy (Men. 95b); and although he was blind he was compensated by a very retentive memory, for he knew by heart the entire body of tannaitic tradition, as well as its amoraic interpretations (Shebu. 41b). He hired a scholar ("tanna") acquainted with the Mishnah and the Baraita to read them to him (Sanh. 86a; Hor. 9a). R. Ḥisda, when he met Sheshet, used to tremble at the wealth of baraitot and maxims which the latter quoted ('Er. 67a). Sheshet also transmitted many sayings of the older tannaim, especially of R. Eleazar b. Azariah (Mak. 23a; Pes. 118a). 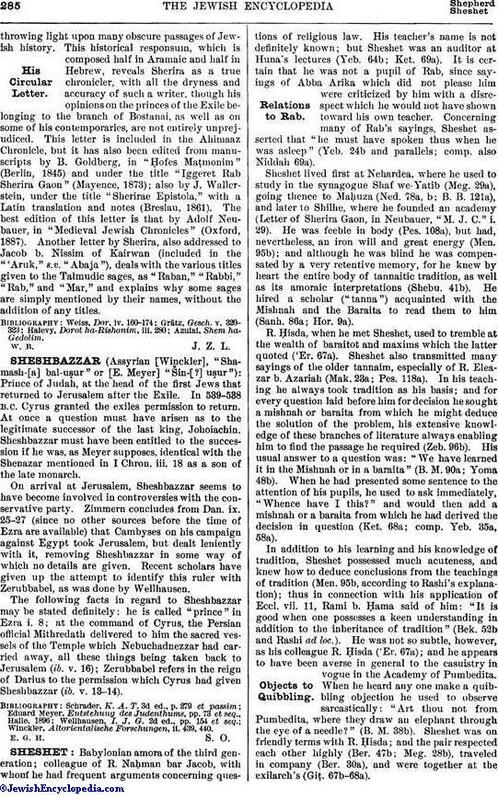 In his teaching he always took tradition as his basis; and for every question laid before him for decision he sought a mishnah or baraita from which he might deduce the solution of the problem, his extensive knowledge of these branches of literature always enabling him to find the passage he required (Zeb. 96b). His usual answer to a question was: "We have learned it in the Mishnah or in a baraita" (B. M. 90a; Yoma 48b). When he had presented some sentence to the attention of his pupils, he used to ask immediately, "Whence have I this?" and would then add a mishnah or a baraita from which he had derived the decision in question (Ket. 68a; comp. Yeb. 35a, 58a). In addition to his learning and his knowledge of tradition, Sheshet possessed much acuteness, and knew how to deduce conclusions from the teachings of tradition (Men. 95b, according to Rashi's explanation); thus in connection with his application of Eccl. vii. 11, Rami b. Ḥama said of him: "It is good when one possesses a keen understanding in addition to the inheritance of tradition" (Bek. 52b and Rashi ad loc.). He was not so subtle, however, as his colleague R. Ḥisda ('Er. 67a); and he appears to have been averse in general to the casuistry in vogue in the Academy of Pumbedita. When he heard any one make a quibbling objection he used to observe sarcastically: "Art thou not from Pumbedita, where they draw an elephant through the eye of a needle?" (B. M. 38b). Sheshet was on friendly terms with R. Ḥisda; and the pair respected each other highly (Ber. 47b; Meg. 28b), traveled in company (Ber. 30a), and were together at the exilarch's (Giṭ. 67b-68a). Sheshet devoted much time to Biblical exegesis; and whenever he recapitulated his studies, as was his custom at the end of every thirty days, he used to say: "Rejoice, my soul! rejoice, my soul! For thy sake have I read the Holy Scriptures; and for thy sake have I studied the Mishnah and the baraitot" (Pes. 68b). He took comparatively little interest, on the other hand, in the Haggadah; and he himself acknowledged his shortcoming in this respect, saying: "I can not dispute with Ḥana on the Haggadah" (Suk. 52b, and Rashi ad loc.). 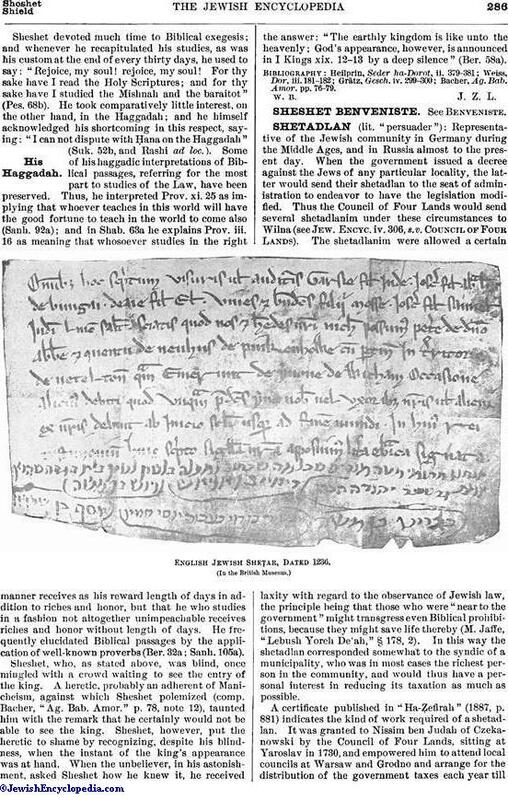 Some of his haggadic interpretations of Biblical passages, referring for the most part to studies of the Law, have been preserved. Thus, he interpreted Prov. xi. 25 as implying that whoever teaches in this world will have the good fortune to teach in the world to come also (Sanh. 92a); and in Shab. 63a he explains Prov. iii. 16 as meaning that whosoever studies in the right manner receives as his reward length of days in addition to riches and honor, but that he who studies in a fashion not altogether unimpeachable receives riches and honor without length of days. He frequently elucidated Biblical passages by the application of well-known proverbs (Ber. 32a; Sanh. 105a). Sheshet, who, as stated above, was blind, once mingled with a crowd waiting to see the entry of the king. A heretic, probably an adherent of Manicheism, against which Sheshet polemized (comp. Bacher "Ag. Bab. Amor." p. 78, note 12), taunted him with the remark that he certainly would not be able to see the king. Sheshet, however, put the heretic to shame by recognizing, despite his blindness, when the instant of the king's appearance was at hand. When the unbeliever, in his astonishment, asked Sheshet how he knew it, he received the answer: "The earthly kingdom is like unto the heavenly; God's appearance, however, is announced in I Kings xix. 12-13 by a deep silence" (Ber. 58a). Bacher, Ag. Bab. Amor. pp. 76-79.